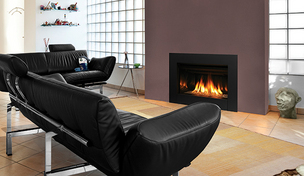 The Ravenna™ CD fireplace insert radiates style and warmth with dancing flames that fill the porcelain-lined firebox. Along with a stunning flame presentation that’s sure to get your attention, the Ravenna CD delivers on performance with a full-featured Total Comfort Control™ remote and variable-speed blower. - Minimum Fireplace Width: 31-1/2"
- Minimum Fireplace Height: 19-1/2"
- Minimum Fireplace Depth: 16"